Thanks for the link. 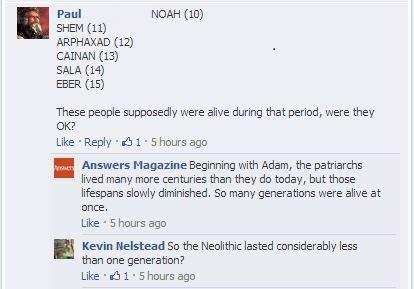 I read your recent comments, and they show how bad some of the answers from Answers in Genesis are. As an old-Earth Christian, one of my greatest concerns about organizations like Answers in Genesis is that their false dichotomy of “If YEC isn’t true, then neither the Bible nor Christianity is true” drives many people like the readers of the BCSE away from Christian faith. But the Bible is not about geology or biology, and neither geology nor biology (nor any other science) should cause one to reject Christianity. 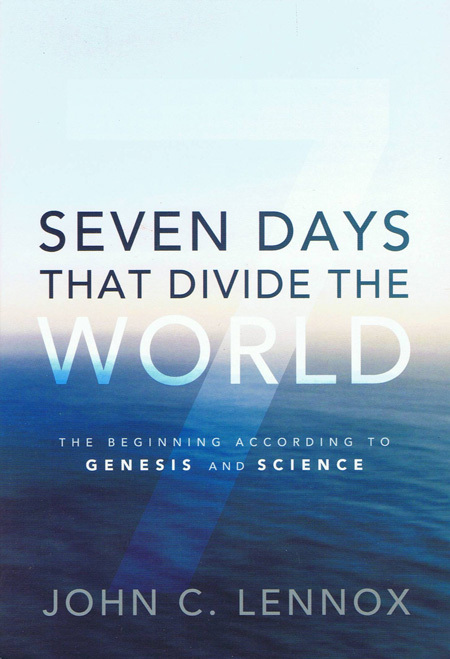 A good many Christians, including a number of the fundamentalists who invented the concept of “fundamentalism” a century ago, and including a number of biblical scholars who hold to the inerrancy of Scriptures today, have no problem with the concept of a universe that is billions of years old, and of life that has the capability to evolve over time. These are secondary issues, and should not stop one from considering the central teachings of Christianity, which have to do with the incarnation, life, death, and resurrection of Jesus Christ. 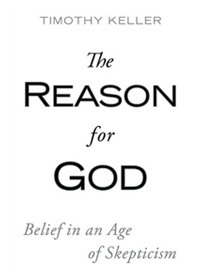 May I suggest the book The Reason for God by Timothy Keller as a reasoned defense of Christianity? Thanks. I’ve just added a little more text to a couple of my most recent posts at the BCSE thread. The BCSE dichotomy is made worse when people such as yourself (formerly YECs) discover that the ‘creation science’ is somewhat ‘dodgy’ to put it mildly. I used to be an evangelical Christian. My gradual loss of faith was not down to either evolution or young Earth creationism (but if I had already read both studied science and read recent YEC apologetics back in 1979 I may never have embraced Christianity in the first place). The “chat” with AIG was pretty poor; questions were ignored mostly. Although the chat was billed as “with the author”, he was not present. Thank you for this site. Although most science sites are silent about faith (and they should be) it is helpful to see these issues addressed by a believer. Many scientists are believers, but are unaware of these challenges to their work, or don’t want to spend time answering the challenges, as they are usually made from a position of ignorance. For the record, I am not a believer but have great respect for those that are. Thanks for stopping by The GeoChristian. Part of the reason I am a Christian is that I think it offers a better (i.e. more rational) understanding of the universe, including its origin. One alternative is “In the beginning nothing created everything,” which is scientifically and philosophically unsatisfying, especially when you consider that “nothing” means “nothing,” including the absence of laws that would allow for things like a multiverse spawning baby universes. Take a look at the “Best of The GeoChristian” link above, where you will not only find scientific and Biblical evidences against young-Earth creationism (which is completely unnecessary biblically, no matter what Ken Ham or Richard Dawkins tell you), but broader arguments for the truthfulness of Christianity. 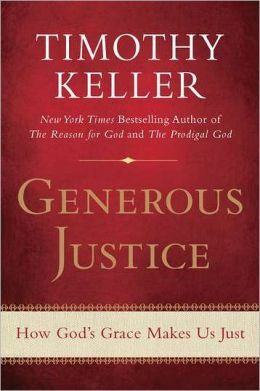 I also urge you to read a good defense for Christianity, such as book The Reason for God by Timothy Keller (I mention that again because that is the best book out there on the topic right now). I am YEC and just found you. I missed the chat thing here and am new to those things. Your wrong about denying the bible got it right about boundaries in timelines and so one can squeeze true earth events into these timelines. 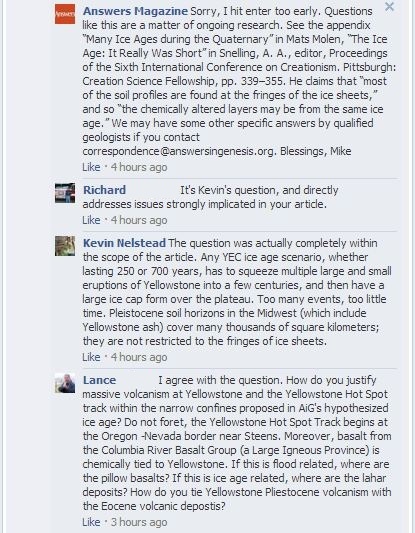 I don’t agree with YEC creationists about the ice age caused by the flood or close to it. I don’t believe there was a ice age but rather a freezing rain age lasting a few years/decades and then a few centuries to get rid of it. 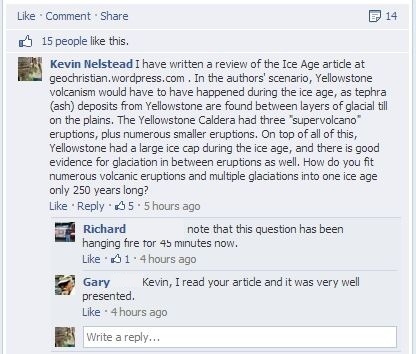 there’s no evidence for the ice ages as they write about it in books. 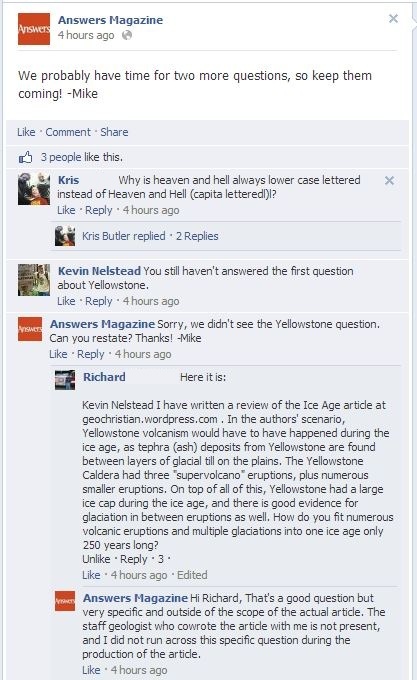 Asking such precise questions about yellowstone misses the bigger point about how biblical creationism easily can fit things into models dealing with short time periods. No one around today saw the past and so why question Genesis and instead trust incompetent mankind ? geology is a poor witness to the past and must be done carefully before great conclusions are drawn. “There’s no evidence for the ice ages as they write about it in books”. Oh yes, there is. I thought the mantra of most YECs was “we have the same evidence as you, but different interpretations of it”. Your claims are highly unconvincing to me. They amount to minority opinions, and you have not provided any facts at all in support of your opinions. Thanks for your comment. Whether the continental and alpine glaciers were caused by snowfall (Snelling, Oard) or freezing rain (your suggestion), there are still too many events, too little time. The Bible does not discuss the ice age(s), so I don’t see a need to try to come up with a “biblical” explanation for the ice age(s). That is a valid interpretive decision on my part. 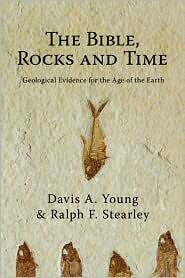 Asking precise questions about things like Yellowstone, paleosols (ancient soils), the Pleistocene fossil record, and so forth, doesn’t miss the point about “biblical” creationism; it points out how young-Earth creationism fails scientifically as well as biblically. I am not denying that “the Bible got it right.” Instead, I am emphasizing that the Bible doesn’t say anything whatsoever about the Pleistocene ice ages, so it is the YECs who don’t get the Bible right. 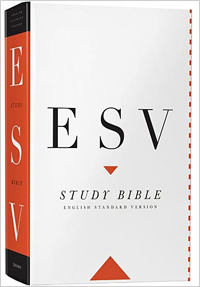 I am doing my best to properly interpret the Bible without reading things into it that are not there. I’m sure I don’t get everything right. All the best to you as well. I’ll be vacationing in Canada this summer. Robert – As I write, I’m in a van traveling from my school on a moraine (a feature deposited by glaciers) across plains leveled by glaciers to a place between the terminal deposits of two separate glaciation events. To say that there’s “no evidence of ice ages” is inaccurate. And even decades of freezing rain couldn’t account for this, especially since as Kevin/Geochristian pointed out that there are non-glacial layers with forest fossils between glacially deposited layers. Forests take time to develop, *especially* when the area has just been scraped clean by a glacier. So there’s no way the glaciers can be crammed into a period of “a few years/decades” based solely on that. And when you consider all the other factors, AiG’s 250-700 years don’t work that much better. 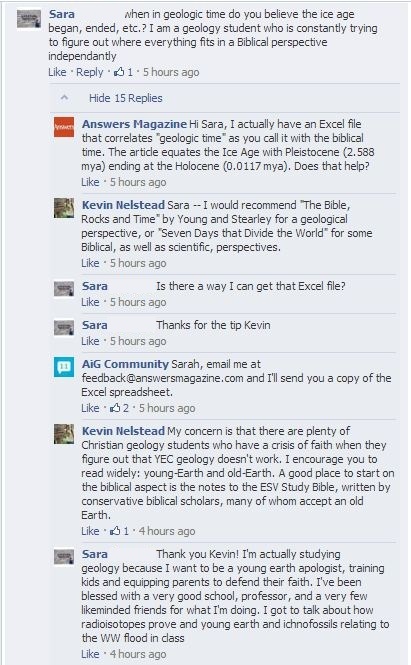 Your idea that the bible doesn’t say this or that about geology misses the YEC conclusion. This is that boundaries are set by the timelines in the bible. Exact dates for creation week or the flood etc. Therefore it must be that everything squeezes into a limited timeline. So the bible is clearly saying this. So any opposition is a target for correction by YEC. Investigation of the claims of evidence from the critics of bible timelines will show the bible is right. Its not a false interpretation of scripture. Its very clear and means to persuade the reader. Its just features on the land. It was not witnessed by modern man. Now here or there glaciers may of pushed this or that. Yet other mechanisms can be invoked for many features without ideas of slow moving glaciers. In North America mega floods are now often cited as the agent for change replacing slow glacier movement. John Shaw comes to mind. not a creationist. I think there was just a severe nuclear winter type of thing and great episodes of freezing rain are the origin for a high ice accumulation lasting a few decades in growth or so. Maybe less. Then this ice melted over a few centuries or less and carved the land. It was just presumed ice could only come from normal snowfall accumulations. Lack of imagination, biblical boundaries, and accurate investigation has made a myth of glacial epochs I think. The difference between you and I is a difference of interpretation. You are convinced that the Bible requires boundaries in chronology, such as the timing of creation and the flood, and I am not. You are convinced (I assume) that the flood had to be global, and I am not. The YEC Biblical argument for a young Earth has three basic foundations: the meaning of “day” in Genesis 1, the idea that there could not have been any kind of death before Adam’s sin, and the global flood. 1. 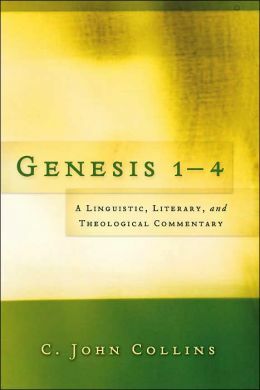 There are indications in the text of Genesis and elsewhere that “day” doesn’t have to be taken as a literal 24-hour day as we understand it. This was recognized by early Christian scholars such as Augustine. There are creation passages where “day” clearly does not mean “24-hour day,” such as Gen 2:4 and Ps 90. If the Bible does not set “boundaries” then neither should we. This is only a very brief Biblical defense of an old Earth; I could say much more. But the key is that my arguments could all be biblical arguments. 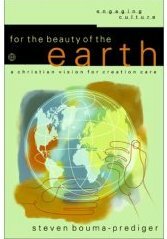 I encourage you to look through the links at my “Best of The GeoChristian” tab at the top of this page. You will find biblical and scientific arguments, as well as a good number of respected biblical scholars and apologists who hold to an old Earth. Your “nuclear winter” accumulation of ice is not even in sync with what the leading YEC geologists say. You are clearly making up your own geology and geomorphology as you go along. This is a sure sigh of “cargo cult” science. How much accumulated ice would it take to transition your glaciers from the ice field stage and actually get them moving across the land? How much would have to accumulate each year to keep them moving? How fast would the scouring of rock have to be to form huge U-shaped valleys such as we see in Yosemite in a few hundred years? When you really start to look at the quantitative implications of YEC, that’s when one sees how it falls apart. Unfortunately, most of my YEC brothers and sisters in the faith never get there – it’s mainly those who are undecided on the issue who can be convinced by people like Kevin that the Earth is very old. There was no moving glaciers across the land. It was created in place, i think, by simple accumulation of freezing rain episodes. Then when it melted it carved up the land. Increasingly today non creationist geomorphologists ascribe land features to mega floods. In special cases like mountains it would also have glaciers moving down in the same way as today and make the u.
let only a special case. Not right to extrapolate from this slow growing and moving glaciers. I t can all fit. No need to toss out clear boundaries from Genesis. WHOA.